I haven't really liked the warlord traits in the main rulebook. Your gunline army could just as easily get "Master of Offense" as your assault army could get "Master of Defense". Both are (mostly) useless to those armies. But now that we have a few 6th edition codexes, I am starting to see that the warlord traits are a very fun part of the game that really adds something new. The only problem is that most of the armies don't have a set of warlord traits tailored to their specific strategies like the Dark Angels, or the Tau do. And that is why I am making some myself. 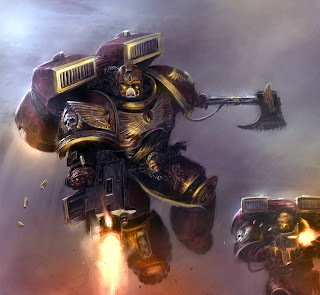 Below I have an initial draft of a set of Warlord traits that I've written up for the Blood Angels (since they're the main army that I play). Eventually I'd like to make a set for each of the armies that don't have their own to tide them over until their new codex comes out. Let me know what you think. Are there any of these that are just too over/underpowered? Any better ideas to replace one? Any tweaks to make the rule better? Obviously these would only be for friendly games, so if anyone tries these out in a game let me know how it worked, and if you have any ideas for an army that I haven't done yet let me know (and maybe leave a little explanation about why it would fit with that army too). Read on to see the traits! Nominate up to D3 Infantry units in your army before deployment. Those units gain the Scouts special rule. Models with the Red Thirst special rule succumb on a roll of a 2 or less. Your Warlord, and the unit he joins during deployment, may choose to automatically arrive from reserves turn 1. Your Warlord, and his unit, gain the Fleet special rule. Your Warlord, and his unit, gain +1 initiative on the turn they assault. Your Warlord, and his unit, have the Counter-attack special rule while they are within 3" of an objective. Any feedback would be greatly appreciated! And be looking out for the next installment which will be Grey Knights (My brother's army). How to add some OSL on the Millennium Falcon. I have been painting 40k off and on since 2004, and have slowly been improving and developing a painting style and I think I have finally found one that I am happy with. But I am still learning and hope to continue for quite a while. Adeptus Astartes, Blood Angels, Bloodquest, Cadian, Catachan, the Chaos devices, Cityfight, the Chaos logo, Citadel, Citadel Device, Codex, Daemonhunters, Dark Angels, Dark Eldar, 'Eavy Metal, Eldar, Eldar symbol devices, Eye of Terror, Fire Warrior, Forge World, Games Workshop, Games Workshop logo, Genestealer, Golden Demon, Gorkamorka, Great Unclean One, Inquisitor, the Inquisitor logo, the Inquisitor device, Inquisitor:Conspiracies, Keeper of Secrets, Khorne, Kroot, Lord of Change, Necron, Nurgle, Ork, Ork skull devices, Sisters of Battle, Slaanesh, Space Hulk, Space Marine, Space Marine chapters, Space Marine chapter logos, Tau, the Tau caste designations, Tyranid, Tyrannid, Tzeentch, Ultramarines, Warhammer, Warhammer 40k Device, White Dwarf, the White Dwarf logo, and all associated marks, names, races, race insignia, characters, vehicles, locations, units, illustrations and images from the Warhammer 40,000 universe are either ®, TM and/or © Copyright Games Workshop Ltd 2000-2012, variably registered in the UK and other countries around the world. Used without permission. No challenge to their status intended. All Rights Reserved to their respective owners.